Looking for a good beach hotel in Kenya? Not all beach hotels are recommendable, but the beach hotels on this page are the best ones available on the whole Kenyan coast. So if you stick to this list, you'll get yourself a fine beach in hotel Kenya. And then, since the sun on the Kenyan coast is shining 365 days a year, nothing should stand in the way of a wonderful stay in Africa's most beautiful country. Beach hotels on this page are listed by beach, since there’s quite some difference between beaches in Kenya. Read my other Kenya beaches page if you want to know more about those differences, and/or read my general introduction to the beaches in Kenya. For booking a beach hotel in Kenya, I’m always advising people Africa Point. 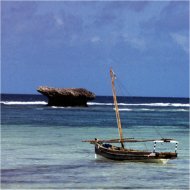 This Nairobi based travel agent is often able to get you good discounts on beach hotels, and they have a sound reputation for patient, personal help with picking the right hotel or any other item in your travel itinerary.